The nature of the project site added a level of complexity to the project with a steep drop to the river on the north along with a steep rock face on the south. 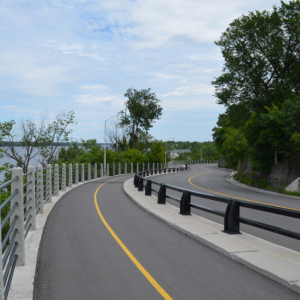 The project included the construction of a new illuminated multi-use elevated pathway overhanging an escarpment cliff along the Ottawa River, the rehabilitation of existing retaining walls, the construction of new retaining walls, roadway rehabilitation using expanded asphalt recycling process and surface asphalt and widening in locations for pedestrian refuge islands at various crossings. 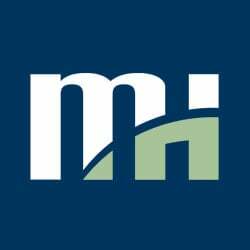 The Morrison Hershfield team developed efficient, economical and sustainable solutions that met all of the Owner’s requirements. In order to accommodate the large scale construction activities, traffic management of vehicles, pedestrians and cyclists had to be constantly monitored and adjusted. Due to the hilly and curved nature of the parkway, traffic management and construction staging were a constant challenge particularly with respect to cyclist, tourist buses, and high commuter traffic. For one stage of construction flexible guide posts were used to establish a bike only lane for the uphill direction while the parkway was reduced to a single lane using temporary signals. Several compliments and very few complaints were received during construction, demonstrating the success. The new pathways were constructed along a cliff by utilizing micropile/steel columns cored into the rock slope in some areas and in other areas new and existing retaining walls were used for the structures foundations. The new pathway was formed with precast concrete slabs (approximately 11 tons each) placed with cranes the paved for a smooth surface. The design and construction of a continuous strip drain installed within the gutter along the rock face marked the first time a continuous strip drain had been installed on a roadway in the City. This has virtually eliminated the seepage from the rock face from reaching the roadway – improving safety and significantly reducing the requirement for salt. The team used a proactive, collaborative, approach to project management to meet the needs of the project and the client despite numerous, complex challenges. The owner chose to defer expenditures by reducing rock investigations during the design phase and moving the detailed investigations to the construction phase. During construction, it was found that the conditions of the rock were substantially different than expected, resulting in the requirement for a comprehensive rock drilling investigation and additional micropiles. During the course of construction, the owner noted an issue with the existing roadway – slippery conditions along a hill consisting of fairly steep grades and tight curves. Along this section of the roadway, a rock cliff face immediately adjacent to the roadway had year round water leakage. The water seeped onto the roadway, freezing in winter conditions and creating treacherous driving conditions. As a result, the road authority responsible for maintenance was forced to salt the area excessively to try to maintain safe driving conditions. It was also noted that this section of roadway runs close and parallel to the Ottawa River and environmental impacts from salt usage were of great concern. How did we overcome this challenge? Once the project was nearing completion, it became apparent that the existing section of pathways and railings immediately to the west of the project limit appeared considerably worse for wear in contrast to the newly constructed facilities in this project. The Client asked what could be done to improve the older facilities using the remaining funds and staying within the timeframe of the current project. Our team developed alternatives with cost estimates and proposed remedial works to improve the adjacent facilities. The completed project is now one of the jewels of the national capital region as it provides scenic views of the surrounding area and compliments the landscape when viewed from the river and from Quebec. The finishes on all of the steel and concrete surfaces were selected to enhance the aesthetics of the facility for both users and those looking at it from afar. The construction of the new pathway forms a missing link in the Capital Pathway system which now allows continuous access between the points west and downtown to points along the river. The project was recognized as one of the top two projects in the region for cyclists in 2014.